Hi everyone and welcome to another episode of The Art of Business English. In this week’s episode we are going back to some fundamental business skills. 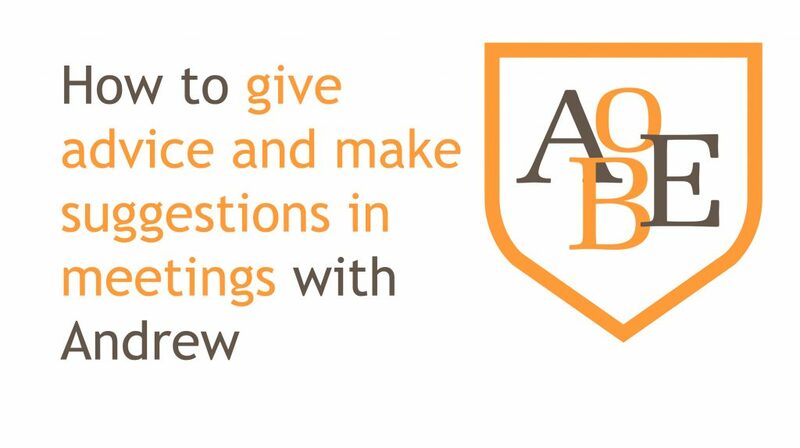 This week we are going to be looking at how you can offer advice and make suggestions in business meetings. So, sit back, make yourself comfortable as we go deep into giving advice and making suggestions. Let’s kick things off today by looking at how we use the second conditional for giving advice. The second conditional is commonly used for giving advice and not making suggestions. I’ll start by quickly reviewing the grammar. If I were you I would try and save more money. If I were you, I would try and talk to the boss first. I would take a few days to consider if I were you. Make sure that you always include a comma after the if clause if the if clause comes first in the sentence. When the main clause comes first the comma is not necessary. In the following part, we are going to look at both the negative form and the contracted forms. Contractions: We can use the contracted form of would, this is very common in spoken English. Negative form: Below we have some examples of the negative form of the second conditional. You will notice that would does not use the auxiliary did, we negate would with not. If you saved more, you would not have financial problems. If you did not negotiate, you would not close any deals. If you saved more, you wouldn’t have financial problems. If you didn’t negotiate, you wouldn’t close any deals. So, now that we understand how to use the 2nd conditional, let’s put it into the correct context for giving advice. The following structure is most commonly used for giving advice. Here you will notice that the subject used is you. Keeping in mind that we always offer advice to someone else, we could also use the following subjects, he, she, you (vosotros) and they. It’s also interesting to note that you can use both was/were in the above structure even though the subject is you. So, to recap, we use the second conditional to give people advice based on our personal opinion. The second conditional is always a possibility and not a strong argument, so it is a nice way to offer advice without being too overbearing. In the next part of this episode I am going to look at modal verbs which are commonly used for giving advice. So, what are modal verbs for giving advice and making suggestions. Let’s review the list. You had better listen to the engineers before going ahead with the project. ​Should and ought to are practically the same in meaning, but had better has more of a warning tone about it. So, if you want to make a strong suggestion then you can use had better. If you want to give general advice or make more generalized suggestions then you can use should or ought to. Let’s have a look at the structure for using these modal verbs. Let’s take a look at how we can apply these modal verbs. Use should and ought to for general advice. You should understand all the facts before coming to a conclusion. She ought to work harder. You had better talk to the manager before making this decision! Use should in questions. Ought to and had better are not common in questions. Should I ask about the salary at the interview? Maybe you should be more careful when posting content to social media. I think he ought to do more due diligence. She probably ought to listen to the client more. Right, now that we understand how to use these common modal verbs for giving advice, we can take a look at some other forms and expressions for giving suggestions. If we want to give someone our opinion but in such a way that it is only suggestive and not really a strong piece of advice then we can use the following structures. doesn’t, and why not are often used to make suggestions. Suggestions are not as strong as advice. You might want to take a look at all the data before you make a decision. Why don’t you ask John for some advice? He understands this topic well. Here we are using typical verbs, modals and expressions for making suggestions. Let’s take a look at the structure. Remember, modal verbs and conditional verbs do not use auxiliary verbs do/does or did to negate or form questions. Before we move on and look at how we can apply these structures, let’s just quickly cover why don’t you. Why don’t you is used to make suggestions and it is quite a soft way of suggesting. It is not as common as the other structures mentioned. The most common and easiest to use is could. the data collected so far? Now I am going to look at how we can use these expressions within the correct context. Might is often used with want to. Do not use could not in negative suggestions. Use might not want to. You might need to discuss that with the team first. You might want to think about the impact this could have on the company’s results. You might not want to could not ask to many personal questions in the interview. Why not and Why don’t/ doesn’t are both question forms and end with a question mark. are very common in conversation. They are not appropriate for formal writing. Why don’t you prepare a survey to find out more about our target audience? Why not arrange a meeting with Mark next week? By now you should have a pretty clear idea of how to give advice and make suggestions. Remember that advice is stronger than suggestions so you need to be careful with the message and tone. If you are giving genuine advice then that is one thing, but if you only want to make a suggestion then you should not confuse the this with the structures for giving advice, especially in a situation where someone follows your advice and the result is negative. In the last part of this episode I am going to bring it all together with some example sentences in context. If I were you, I would get your lawyer to look at this contract. If I was him, I wouldn’t be talking about those things in front of everyone. I feel you should listen to Mary on this issue. I really believe we should send a counter offer. We ought to A/B split test this landing page. You ought to study more if you want to improve your English. John had better lift his game or he will be out of a job. You had better keep quite or you may find yourself in trouble. You might want to give Bruce a call. He is an expert in this field. She might want to have a quick work with Danny. I’m sure he will know the answer. We could always say no. You could try looking for another job. Why don’t you cut your losses? Why doesn’t he try listening to what people are really saying? OK, there you have it, an in-depth look at giving advice and making suggestions. You can apply this information straight away in your next meeting, or email. These expressions are very common and super easy to use. Just remember that many of them are modal verbs or conditionals, so they are negated using not. We can’t use auxiliary verbs do/does, except for the expression why don’t you…? As I have mentioned, using these expressions within the correct context is a very important part of the puzzle. You need to be certain that you apply the correct tone so that people understand the difference between a strong piece of advice and a softer one. Don’t use had better incorrectly, as it is a warning. Make sure you are using the correct structures for suggestions and that you don’t confuse them for advice. Well that is all we have time for today, I hope you have loved the episode and the content. Remember to get in touch with me directly if you would like to request a topic or if you have any questions. I am also interested in having my listeners on as guests, so if you have an interesting story to share then don’t hesitate to get in touch. You can email me, post to our Facebook page or comment on our website. As always, if you enjoyed this episode, share it with your friends and family and be sure to subscribe to the AOBE podcast on iTunes or Stitcher. Until next week, take care and have fun giving advice and making suggestions.